The app was developed by Center for Development of Advanced Computing (CDAC) Mumbai. The app apk can be downloaded from here. 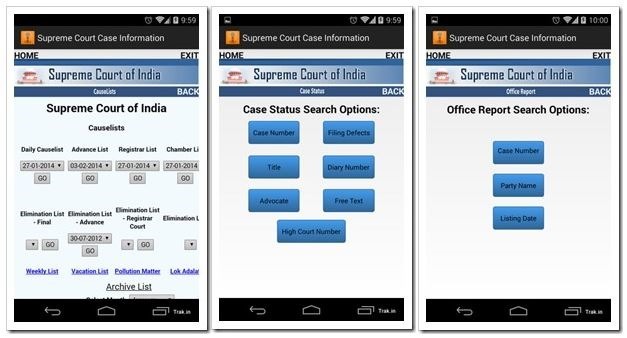 The earlier version of this app only had the respective item number of cases which is heard across various courts. The previous version of the app was a replica of the display board present in the Supreme Court. The new app gives information on the court’s display board, cause lists, office reports case status, daily orders and judgments. There is nothing much to write about the UI of the app as it is plain vanilla simple and does the task at hand. However, accessing various information available on this app becomes quite tedious, as it has not really been optimized for smaller screen. For example, Searching for case information, opening it and reading all the details may start giving you a head-ache after a while, as a mobile user needs to constantly scroll horizontally and vertically to read the full information. To add to the woes, the fonts, the icons and the colors used don’t make it any easier for you to access the information. The alignments of icons are wonky and the font is sometimes unreadable! So while this app brings all the information to your fingertips, the presentation of data will leave you very frustrated. Check out some of the screenshots of the app to understand what I am saying. I am sure that after looking at the screenshots above, you may have understood what an arduous task it may be for user to access all the information! But with all the drawbacks the app has, the Supreme Court app is sure to helpful for the lawyers to keep track of the proceedings in the Supreme Court. This app is sponsored by the by the Department of Electronic and Information Technology (Deity). Interestingly, this app has not been put up on the Android play store, which would have been much easier for people to find and install! 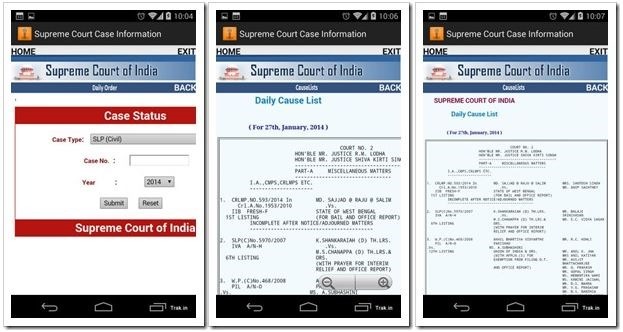 A similar Android app was released by the Kerala High Court Advocates Association which gave information regarding the number status of all court cases inside the Kerala High Court. The app is named “Kerala High Court Case Status” and is available for download in the play store. Even the Ministry of External Affairs had launched mobile apps for both Android and iOS to address long queues of various services and to give information about visas, passports, embassies, diplomacies, etc at a single place. The app provides daily updates from over 100 Indian embassies and there is also an option to follow the Prime Minister when he is abroad. MEA’s app provides a lot of information for people who are moving abroad and for people planning to travel to India. This app was the first ever app launched by any Indian industry aimed at the public. This project is a part of the National e-Governance plan (NeGP) and was executed in a public-private partnership with Tata Consultancy Services (TCS) as the private partner. To provide information on the passport process, the Consular, Passport and Visa division (CPV) of the MEA had launched mPassport Seva Android app. Although this app is good, MEA’s app does the task too. It is nice to see that various Government bodies are venturing into bringing the services on mobile apps. lot more people have smart phones rather than desktop and app development seems to be the right way to go!